Brittany Williams of the University of Maine (3) slices down the lane against Hartford during Wednesday night's America East game at Chase Family Arena in West Hartford, Conn. The Hawks beat the Black Bears 73-43..
HARTFORD, Conn. – The University of Hartford rattled off a 16-7 spurt to open the second half to transform a six-point halftime lead into a comfortable 41-26 lead and the Hawks pulled away for a 73-43 America East victory over the cold-shooting University of Maine Wednesday night. Hartford is now 5-10 overall but improved its conference record to 2-0. The Black Bears fell to 2-12 and 0-2, respectively. The Black Bears shot only 25.5 percent from the field and 16.7 percent from three-point land. Hartford shot 50 percent from the floor including 56.2 percent from beyond the arc. The Hawks placed four players in double figures led by Mary Silvia and Ilicia Mathis, who finished with 13 points apiece. Amanda Weaver scored 11 points and Alex Hall tossed in 10 more. Nikkia Smith and Silvia combined for 15 rebounds and Smith also handed out four assists to go with her six points. Mathis grabbed six rebounds and Daphne Elliott contributed five rebounds, three steals and two assists. Freshman Ashleigh Roberts scored a game-high and career-high 18 points for the Black Bears for her sixth straight game in double figures. Amber Smith scored nine points for the Black Bears and Ali Nalivaika had a career-best seven rebounds and eight points. 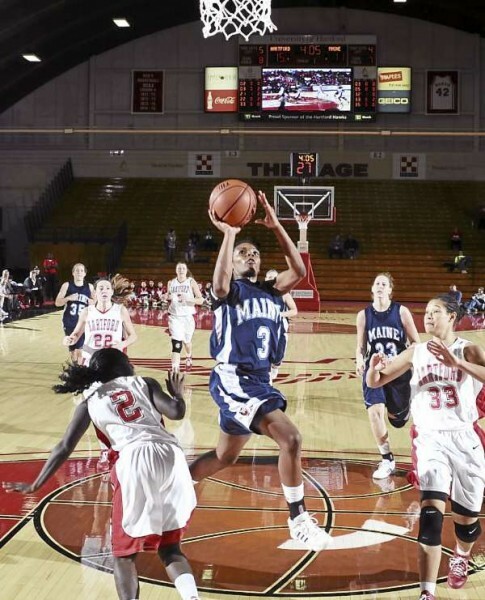 Shareka Maner had a career-high eight rebounds for Maine. “We struggled offensively in the first half but, defensively, we were really sound,” said Maine coach Cindy Blodgett. “We had some nice looks but we weren’t quite able to get (our shots) to go. We had three or four steals but we missed contested layups. Hall had a pair of three-pointers during the 16-7 flurry and Silvia had another one. Maine had just two assists in the game. “That shows a lack of ball movement,” said the Maine coach. Maine will return home for a noon game on Sunday against UMBC. At Castine, Brittany Hunt scored a game-high 24 points in leading Maine Maritime Academy past Wentworth Institute of Technology in the championship game of the Mariner Classic Tournament. Samantha Goda had 14 rebounds and seven points for the Mariners. Kendra Kerr led Wentworth with 16 points while Kirsten Vallone added 10 points and 10 rebounds. At Castine, Jenn Colpitts scored 14 points as the University of Maine at Fort Kent held off Elms College to win the Mariner Classic Tournament consolation game. Angela Norsworthy had 13 points and three blocks for the Bengals. Megan Land scored 11 points and Maliesha Caesar added 12 rebounds and eight points. Erika Murphy led Elms with 18 points, nine rebounds and three steals. Jen Normandie scored 13 points. At Gorham, Courtney Cochran tallied 15 points and 16 rebounds and Renee Nicholas had 15 points, 11 rebounds and three steals to power the University of Southern Maine past Husson University of Bangor. Kaylie DeMillo had 12 points and Erin McNamara had 10 points and four assists. Brianna Hanscom led Husson with 18 points. Bethan Sevey scored 13 points. At Lewiston, Brian Ellis led the Bates Bobcats with 16 points and Alex Gallant of Bangor scored 12 for the Bobcats. John Squires added 10 points for Bates. Charles Fenner scored 22 and Chas Rentrope 12 for the University of New England Nor’easters. At Gorham, Corteze Isaac hit a long jumper with 10 seconds remaining to lift the host Huskies to victory over the Eagles. The teams had traded the lead, with Southern Maine’s Sean Bergeron making a layup to give the hosts an 81-80 advantage with 1:32 left and Husson’s Luis Medina countering with a layup to give the Eagles a one-point edge with 1:09 to play. The squads traded turnovers before Isaac hit the game-winner. Otis Smith poured in a team-best 26 points to pace USM, while Isaac finished with 20 points and Bergeron 14. The Huskies shot 58 percent for the game. Jay Uhrin tossed in a game-high 27 points to propel Husson of Bangor. Josh Jones tossed i 23 points and Marc Zaharchuk posted 12 points.